Looking for Package Deals to Ocean City / DE Shore? We have those too! Stay on the North End in a great 5 bedroom townhome and play 3 top tracks from $153 person per day! Prices are based on 8 golfers in a 5-bedroom townhome. Extra nights available. Other courses also available. The Peninsula Golf & Country Club - With a grand final hole proclaimed by Jack Nicklaus as "the Pebble Beach of the East", this magnificent course created by the golf legend-turned-architect strikes the perfect balance between aesthetics and playability. 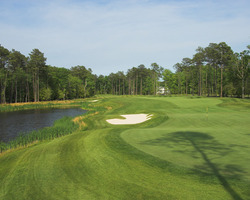 The 7,200-yard, par 72 masterpiece is the first private Jack Nicklaus Signature Design golf venue in Delaware, carefully constructed with a true respect to mother nature. The "Golden Bear" crafted seven scenic holes that hug the waters along the Indian River Bay and Lingo Creek, setting the stage for The Peninsula's unique Troon Golf Experience. Play 3 Ruark Courses and receive a $50 gift card to Ruth's Chris per foursome for dinner for 4. (Must purchase 4 dinner entrees) Play 4 Ruark Courses and receive a $50 gift card per foursome for dinner for 4 at Ruth's Chris and Lighthouse Sound. (Must purchase 4 dinner entrees) The Man O'War Course occupies the westerly portion of GlenRiddle. Located in Berlin, MD; just minutes from Ocean City, the course features pure, windswept links golf. The golfer will face challenges often found in the British Isles including large greens, double fairways, pot bunkers, sand dunes, and the ever-present eastern shore winds. The historic racetrack used to train champion thoroughbreds is utilized as a strategic cross hazard on three holes. The Man O'War Course plays 7,035 yards and is a par of 72 from the rear tees. Play 3 Ruark Courses and receive a $50 gift card to Ruth's Chris per foursome for dinner for 4. (Must purchase 4 dinner entrees) Play 4 Ruark Courses and receive a $50 gift card per foursome for dinner for 4 at Ruth's Chris and Lighthouse Sound. (Must purchase 4 dinner entrees) Glen Riddle's War Admiral Golf Course is located in Berlin, Maryland, just minutes from Ocean City. 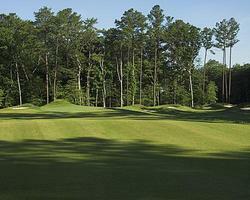 The course is routed through mature forest and will offer a completely different golf experience. The course is sheltered from the wind, but provides a demanding test from the tees. The site's beautiful tidal marsh comes into play on five dramatic holes, offering amazing views. Rugged, breathtaking bunkers reminiscent of golf's great past are signatures of the War Admiral Course. From the rear tees the course will play to a par of 72 and a length of 6,868 yards.